Theni forest fire LIVE UPDATES: On Sunday, Defence Minister Nirmala Sitharaman said that the IAF had been instructed to help the rescue operation. Follow this space for more updates. Theni forest fire LIVE Updates: Rescue operations are underway on the spot. The death toll in the Theni forest fire in Tamil Nadu’s Kurangani district has risen to 10, officials confirmed on Monday evening. The district collector’s office also released a list of names identifying those injured as well as those yet to be traced. 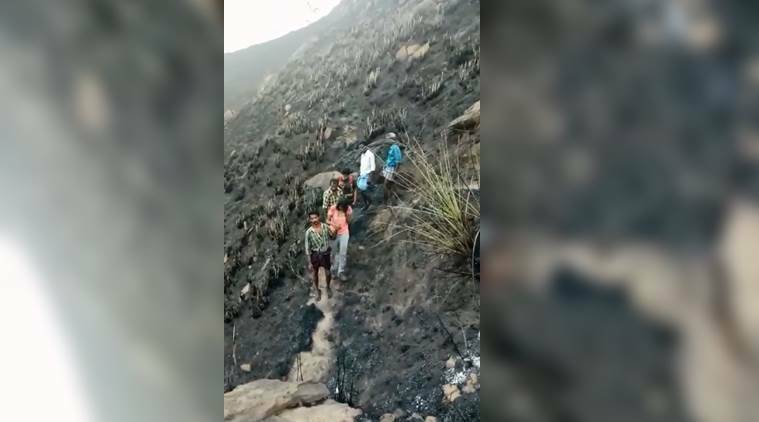 At least 65 trekkers from Chennai, Coimbatore and Tirupur were trapped on Sunday in a fire that swept through the Tamil Nadu forest, bordering Kerala. Many of them were believed to be college students, IT employees and families with children. Officials said the incident was first reported by some of the trekkers over mobile phones to their families who alerted police, which launched the rescue around 5.30 pm. Defence Minister Nirmala Sitharaman said that the IAF had been instructed to help the rescue operation. “Responding to the request from the Hon @CMOTamilNadu on the forest-fire related issue — 20 students are caught in Kurangani, Theni district. Instructed @IAF_MCC to help in rescue and evacuation. The Southern Command is in touch with the Collector of Theni,” she tweeted. Speaking to reporters, Sitharaman said at least four helicopters are ready to resume rescue operations on Monday morning. “We are sending 10 commandos to reach the spot by midnight with adequate medical aid,” she said.